A common application where accurate flow totalization is required is gas usage monitoring. In this application there is typically a single source of gas being shared by several different users or locations within a facility. To account for usage, or allocate costs properly, the facility needs to monitor the amount of gas consumed by each user. 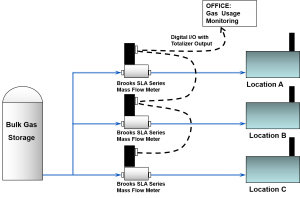 A typical installation for this application includes several flow meters, secondary electronics with totalizer function cabling from each device connected to a central monitoring system. 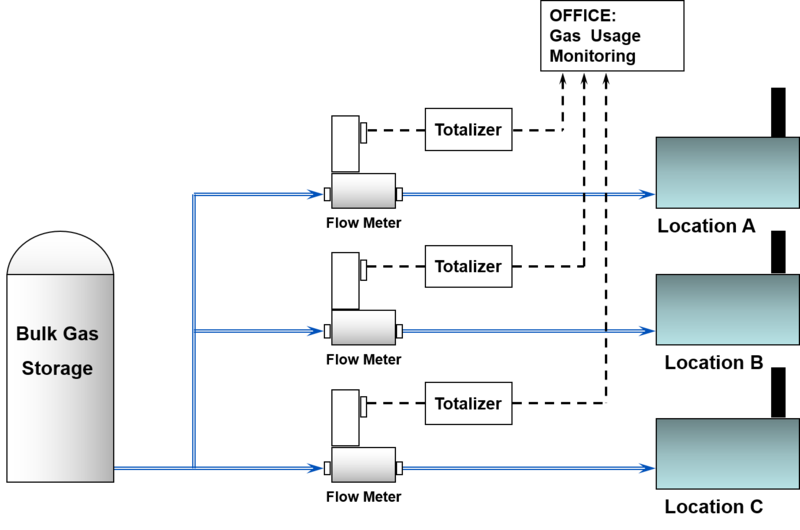 The totalizer gets a flow signal from the flow meter, calculates the totalized flow and sends that value to the central monitoring system. Typical gas usage monitoring installation With this approach the accuracy of the totalized flow may not be optimized. There may be some additional error due to resolution of the analog to digital converters (ADC) and signal noise. The user also needs to be sure the analog signals were calibrated properly and that they match the span and time units of the flow meters. 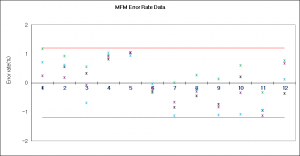 Signal filtering, signal cutoffs, sample rates and sample period can also have an impact. All of these factors could lead to improper billing or cost allocation. There is also additional hardware and cabling costs with this approach that could be avoided. An alternate approach uses digital mass flow meters, like the Brooks SLA Series, which calculate the totalized flow value internally. 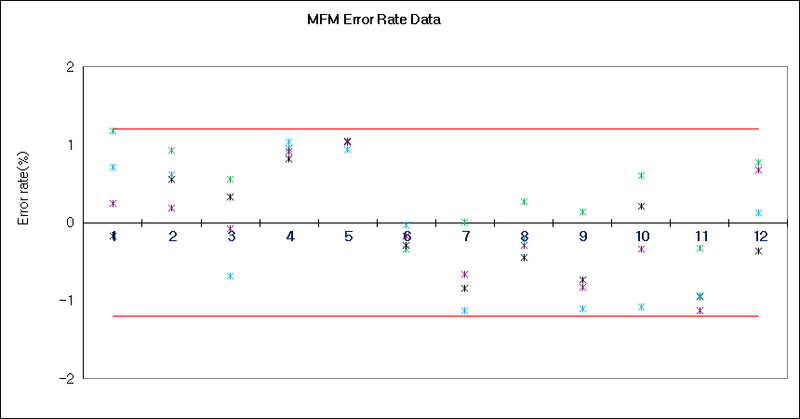 With this approach, no additional inaccuracy is introduced with a secondary calculation or digital to analog conversion. [caption id="attachment_1701" align="alignleft" width="300"] Gas usage monitoring installation using Brooks SLA Series Mass Flow Meters[/caption] Another advantage of this approach is that the user is able feed the totalized flow value directly to the gas monitoring system via digital communication. This eliminates the need for the totalizers and simplifies the wiring, therefore reducing the total installed cost of the system. To confirm the totalized flow accuracy of the SLA Series mass flow meters, Brooks Instrument used a Bell-Prover (traceable flow calibration standard) and a formal totalizer verification process. With this approach we were able to demonstrate totalized flow accuracies of better than 1.2%. The chart below summarizes the data for 12 devices each run at four (4) flow rates. Brooks Instrument SLA Series mass flow devices are available with a variety of digital communication protocols and a range of options to satisfy even the most difficult applications including hazardous area and outdoor installations. To learn more about our proven mass flow devices for gas usage monitoring or any other application where totalized flow is required, please contact us.